Professional results for professional detailing! Meguiar’s Ultra Pro Speed Compound was designed to provide body-shops and professional detailers with the perfect compound to take care of the severe damage they will inevitably be forced to fix. Meguiar’s Ultra Pro Speed Compound is graded to correct up to 1,200 grit sanding marks, so it is ready to take on even the most neglected cars you run into. 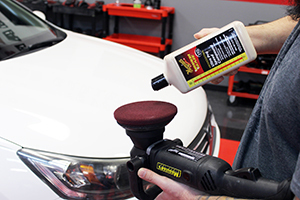 Meguiar’s Ultra Pro Speed Compound has a very long working time, easy wipe-off, and very little slinging and dusting, these qualities make it an excellent choice for any professional! When you need great results, as quickly as possible, Meguiar’s Ultra Pro Speed Compound is the way to go! When you are working in a body-shop or as a professional detailer, you see the worst, most neglected cars out there. When one of these poor, metallic creatures rolls your way, you know that it will be a tough beast to tame. It will likely be riddled with severe scratches, swirls, and oxidation, the likes of which few have seen. In these situations, you need a compound that packs more punch than just your standard one step cleaner wax. In instances like this, Meguiar’s Ultra Pro Speed Compound will be the product you reach for every time! The most important aspect of a heavy-duty compound is the level of damage severity it is able to correct and how quickly it can accomplish said correction. Meguiar’s Ultra Pro Speed Compound was designed with a formula that maximizes correction results by pushing the working-time to the maximum. This extra-long working time also give the product plenty of time to evenly correct the finish, meaning it will buff out much more smoothly than other comparable products. The formula for Meguiar’s Ultra Pro Speed Compound generates almost zero dusting and hardly slings at all, meaning you won’t have to spend hours wiping residue off the car afterward! Because Meguiar’s Ultra Pro Speed Compound is designed for professional use, it was infused with qualities that make it exceptionally qualified for such a difficult task. When working on cars professionally, the major concern is getting the best results possible in the shortest amount of time with the least effort involved. The major time and effort sinks are in the clean-up. Meguiar’s Ultra Pro Speed Compound solves this issue by greatly reducing the amount of mess it makes in the first place. On top of these unbelievable qualities, Meguiar’s Ultra Pro Speed Compound is even completely body-shop safe! You won’t accidentally imbue the paint with fish-eyes before it has been able to completely cure! 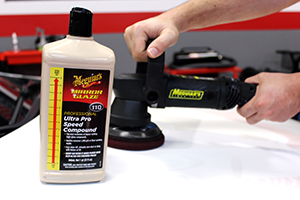 Meguiar's M11001 Ultra Pro Speed Compound 128 oz.